January 2019 witnessed same trends and increased in the number of violent incidents by VEOs and as a result of inter-communal tensions. 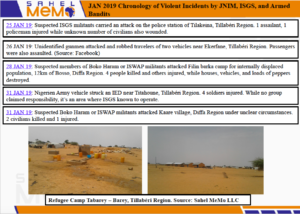 Although not officially claimed, Islamic State in the Greater Sahara (ISGS) and Jama’t Nusrat al-Islam wal Muslimeen (JNIM) are strongly suspected to be responsible for the attacks against Nigerien security forces in Tillabéri Region, and to be behind acts of robberies seeking resources. Same could be said about Boko Haram and Islamic State in West Africa Province (ISWAP) in Diffa Region where number of incursions and robberies against local shops were recorded. Highly likely these violent trends to continue and to expand to other parts of the country, notably on the borders with Mali, Burkina Faso, and Nigeria.